Judy Kensley McKie is one of America’s most beloved furniture designers and makers. Working in her own studio in Massachusetts, she has developed animated and personable forms that captivate people of all ages, while also impressing peers for their formal finesse and technical expertise. Particularly iconic, within her oeuvre, are her zoomorphic works: benches that assume the form of monkeys or alligators, tables held up by obedient-looking dogs or alert hares. These pieces are influenced by the style of Art Deco but have an offbeat charm all their own; they somehow manage to achieve a sleek sophistication while also recalling a hand-drawn children’s book. Even the best artists sometimes need help, and this was the case for McKie when – encouraged by her colleague, the Bay Area furniture artist Garry Knox Bennett – she began to work in cast bronze. This required specialist fabrication skills. Shortly thereafter, McKie was introduced to the Italian immigrant and master artisan Piero Mussi, whose Artworks Foundry is one of the top workshops in its field nationwide. 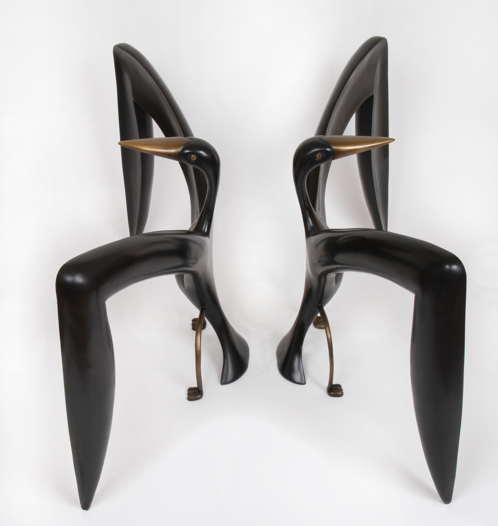 Beginning in the early 1990s, McKie collaborated with Mussi and his skilled moldmakers, casters and finishers to realize her furniture. The foundry preserved a full record of this creative partnership, keeping not only examples of finished work in bronze, but other objects from the making process, including sketches, handcarved models, and casting molds. Further animating the exhibition, visitors will experience include a full range of preparatory materials and finished works, as well as photographs of the process and the foundry itself, personal reflections from Piero Mussi and other technicians at Artworks Foundry. The installation is conceived of in two sections, including finished bronze works, as well as works in-process: sketches, models, wax-cast and molds. An exhibition catalog features a lead essay by guest curator Glenn Adamson, a preface by renowned studio furniture maker Garry Knox Bennett, an interview with Piero Mussi, and an essay by Edward S. Cooke, Jr., the Charles F. Montgomery Professor of American Decorative Arts in the Department of the History of Art at Yale University.